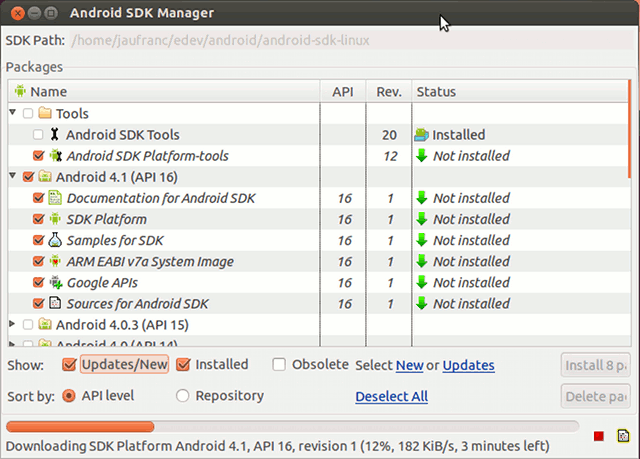 The official instructions to install Android SDK do not appear to be really up-to-date for Ubuntu 12.04, so I’ll post how I’ve installed the Android SDK and Eclipse on Ubuntu 12.04. 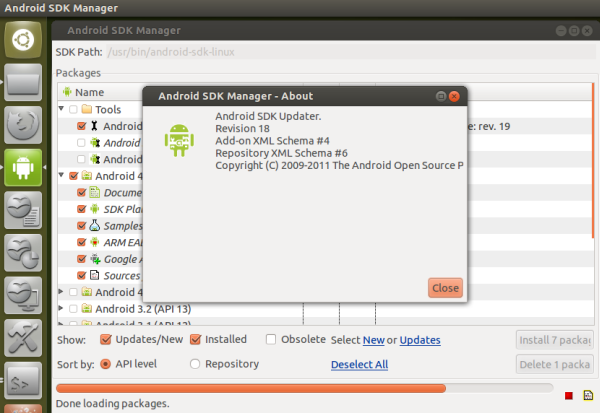 Android SDK Manager should show up. Use the default recommended packages and platforms, as well as any extra packages you may need, and click on Install x packages, accept all licenses and after installation is complete, the Android SDK is installed. Click on OK, and Check “Developer Tools” and click Next, and complete a few more easy steps until the installation completes. The final step after you’ve installed ADT and restarted Eclipse, is to set the location of the Android SDK directory. 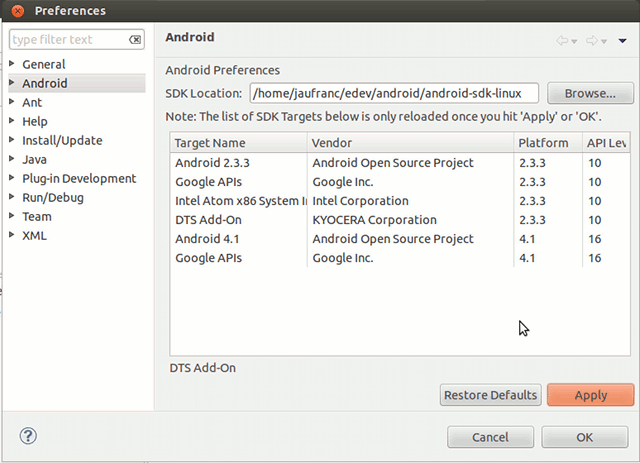 Select Window->Preferences…, select Android and click on Browse to set the location of your Android SDK directory (android-sdk-linux), then click on Apply and you should see a list of Android SDK targets. 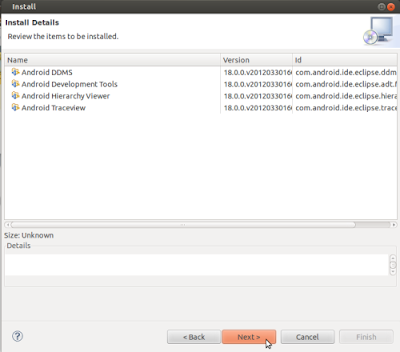 Click on OK. That’s it, you’ve now installed and configured the Android SDK and Eclipse in Ubuntu, and are ready to get started with App development. 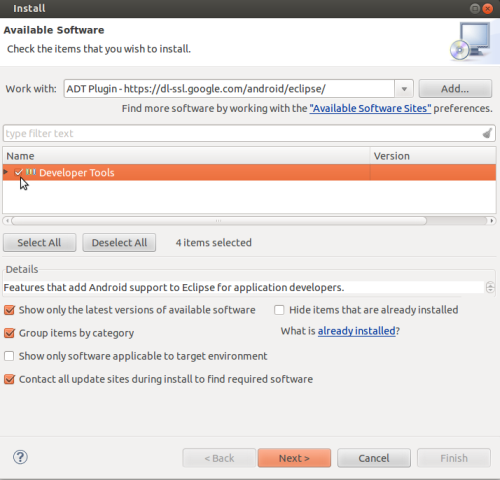 Ubuntu 11.04 (Natty Narwhal) ) is one of the most popular Linux distribution on this planet while Java, the most popular programming language (Platform independent features makes Java Great! 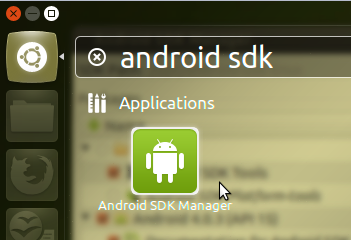 and superior to any other programming language, for building web and Desktop Applications). Due to a number of free( and of course they’re good) tools, compilers and other options Ubuntu has become the No. 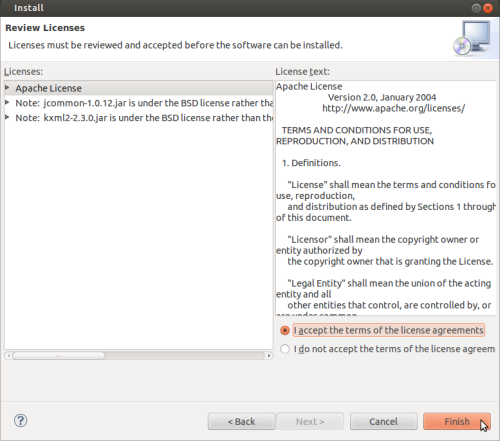 1 choice, as a development platform, among the Java Developers (specifically young programmers).